Nike – what started off as a tiny importer of Japanese trainers in 1964 is the biggest and most popular sports brand in the world in 2017 with a total revenue of almost $35 billion! It’s difficult to keep track of all Nike basketball shoes that exist on the market: Nike not only designs the signature models of Kobe Bryant, Lebron James, Kyrie Irving, Kevin Durant and Paul George, but also popular team models like the Hyperdunks, or the Lebron Soldier series; not to mention the wide variety of cheaper budget models. 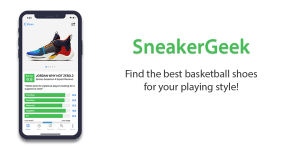 To get a good idea of all the models on the basketball shoe market I have decided to create a database with all basketball shoes where I could find at least three trustworthy reviews on Youtube or sneaker blogs. In total, I have added 81 shoes so far and read or watched exactly 477 reviews in doing so. Bouncy forefoot Zoom Air cushioning and traction that performs even on dusty courts. Affordable all-around performer without any weaknesses. Sneaker reviewers like almost everything about the PG3 - except its looks. The "moon crater" traction pattern works very well on all surfaces but might take a little while to break in. The Zoom Air cushioning in the forefoot is responsive and bouncy and the foam in the heel provides decent impact protection. Materials feel a little cheap in-hand, but are comfortable on-foot and absolutely get the job done. Overall, the PG3 is a great performer that will work for a wide array of players and comes at a very fair price of only $110. All sneaker critics agree: The Lebron 16 is a huge improvement over the XV and one of the best shoes of Lebron's signature line in a long time. The traction works on all surfaces, the cushioning is a little more versatile but still very comfortable, and stability is much-improved thanks to the use of tiny lateral outriggers on the outsole. The Battleknit 2.0 looks and feels very premium and provides great lockdown and containment. Overall, the Lebron 16 is an outstanding performance hoops shoe that is especially recommended for explosive and powerful wing players. Nike has been in the basketball shoe business forever and they have really perfected the fit of their shoes in my opinion. All versions of a specific model run similarly long and wide. That means if last year’s Kobe model fit you perfectly in size 10, then it’s highly likely that the next model will too! There is no need to find a sneaker store to try on each pair. I bought Kobe models online for years on and never had any problems, the same can’t be said about every shoe brand! Most of the great basketball players have signed a signature deal with Nike. If you’re a fan of Kyrie Irving, Lebron James, Kevin Durant, Paul George or Kobe Bryant then you’ll definitely want to go with Nike and rock their latest signature models. 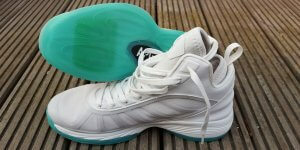 Nike has always been a driver of innovation in the world of performance basketball shoes. 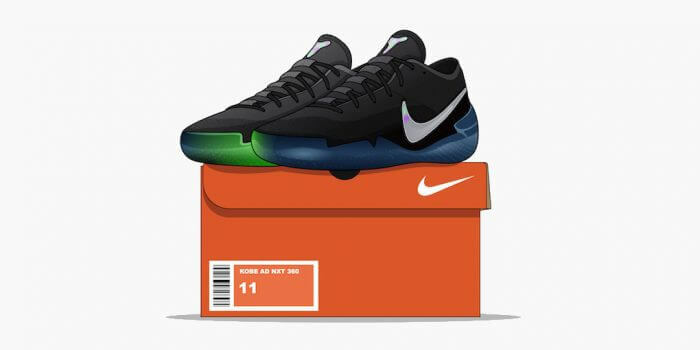 The debut of Nike Zoom Air revolutionized the cushioning of basketball sneakers in 1995 and even over 20 years later it’s still the most responsive cushioning system on the market! There is no denying that Nike makes some of the best looking basketball shoes on the market. Phil Knight bought the design of the now famous Nike swoosh for an incredible $35 from design student Carolyne Davidson – that’s got to be one of the best investments of all time! 5. There’s a Shoe for Everybody! 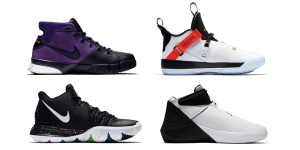 Nike releases so many basketball shoes – they truly have a model that works perfectly for every type of basketball players. Big and heavy guys pick the Lebron 15, quick guards the Kyrie 4 and if you like cushioning and have narrow feet then the KD X is perfect!